Love Your Body is an initiative focusing on healthy, positive care and views of one's body. Core areas of this initiative are fitness, nutrition, and body image. From exercising for the fun of it, dining on a variety of foods, and loving the skin you're in, this broad-reaching initiative is dedicated to encouraging a campus culture of self-defined and self-fulfilling physical and mental health for everyone. 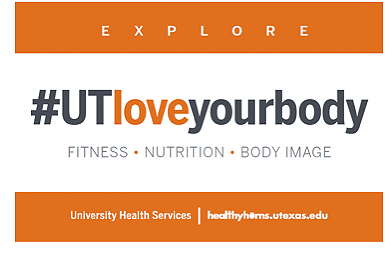 To participate, follow our social media postings on Facebook and Twitter using #UTloveyourbody. Fitness - Take care of the body you're given in ways that are enjoyable for you. Not everyone loves hitting the running trails or pumping iron in the weight room, but everyone can find ways to get physical activity on most days of the week through activities that they do enjoy doing or find relatively easy to incorporate into their lives. Park farther away at the grocery store. Get off the bus one stop early. Get in the habit of taking the stairs. Nutrition - Enjoy a variety of foods throughout the day in moderation. Restricting foods or feeling guilt about eating certain foods is not healthy, realistic, or sustainable. Practice mindful eating by listening to hunger cues: eat when hungry, stop when full. Body Image - There is no perfect body. One's health status cannot be determined based solely on exterior factors. Appreciate your body today for the things it can do. During sleep, we repair ourselves and commit information to long-term memory. Our bodies enable us to traverse the 40 Acres in the Texas heat. Talking negatively about your own or another's body is not motivating or encouraging the adoption of healthy behaviors; rather, it is toxic. Challenge yourself and others to love the skin you're in. Listen to your body. Eat when you are hungry and rest when you are tired. Throw out the bathroom scale. You are much more than a number on a scale. Instead, focus on the most important things about yourself like your unique talents, qualities, skills, and characteristics. Exercise to feel good and be healthy, not to lose weight or punish your body. Find fun ways to add more physical activity in your life, such as going for a walk with a friend. Wear comfortable clothes that fit. Clothes that are too large or too small tend to create physical discomfort and may make you feel even worse about your body. Clothes that fit you well are designed to complement your figure. Ignore the size tags if possible because you are not a number. Accept and love your body as it is. If you treat it as a dear friend, you'll find it much easier to eat, exercise, and rest in balanced and healthy ways. Housing and Food Service Nutrition Services - For help navigating the dining halls or managing a food allergy on campus, check out the Housing and Food Service Nutrition Services.